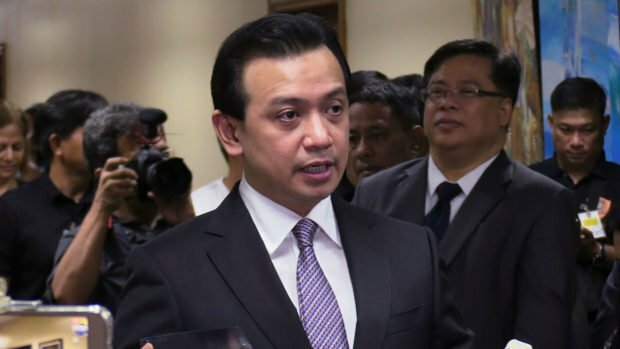 Makati City Regional Trial Court Branch 150 Judge Elmo Alameda on Friday insisted that the “best evidence” on the case of Senator Antonio Trillanes IV is the hard copy of the amnesty application form. Alameda said if Trillanes can present the application form, it will be the end of the proceedings. On Friday, the Makati court handling the rebellion case against the senator conducted a hearing on the motion for reconsideration to set aside the arrest order and affirm its 2011 decision dismissing the rebellion case against Trillanes. “What the court wants is the primary document, the hard copy, the zerox copy [of the amnesty application form],” Alameda said. Trillanes’ amnesty has been revoked by President Rodrigo Duterte for allegedly not submitting an application form for it and admitting his guilt over two failed mutinies during the Arroyo administration. The said rule excludes secondary evidence once the original is available. “We are talking here of the act of physical filing and therefore all evidence should be admitted,” Robles pointed out, adding that testimonial evidence will be the best evidence in the case of Trillanes. Robles also said that witnesses of the government itself admitted that all the amnesty documents are missing. “Why do we have to present evidence when they are the once saying that the documents are missing?,” Robles asked.